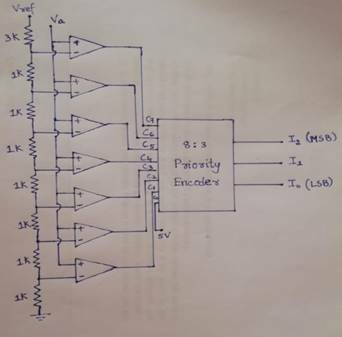 Abstract -A 3 bit analog to digital converter using comparators and priority encoder giving digital output is designed, and implemented using transistor-transistor logic and the subcircuits used for logic gates are implemented using CMOS logic.It is also called parallel ADC. » An analog-to-digital converter (A/D or ADC) produces a digital output (Bits) corresponding to an analog input voltage sample. » The comparator outputs connect to the inputs of a priority encoder circuit, which produces a binary output. The circuit shown in figure takes the given analog signal as input (varying from 0-8v) and produces a digital output corresponding to the input given. In this circuit ,we used 7 comparators and a 8:3 priority encoder. There are 8 resistors for adjusting range and the reference voltage is taken as 10volts. A. According to voltage division rule, voltage at 7th comparator will be Vref*(1k/10k) ie, 1V similarly at sixth comparator Vref*(2k/10k) ie, 2V. In this way all voltages will be divided as shown in table III. B. Span is defined as the difference between maximum and minimum analog input voltages and here, it is 8v. step size is given by span/2^n where n is number of bits in the binary output(here, n=3). Hence, stepsize is 8/8=1. 7 th comparator output will be (Va-1) > 0 so logic 1 and for sixth comparator (Va-2) < 0 so logic 0. In this way we get 0000001 which will go to priority encoder input and the digital output will be 001.